MAROS - National Park Bantimurung, Maros, South Sulawesi, became one of the most popular place for tourists, both local, national and foreign. "Bantimurung National Park has many uniqueness which makes it as one of the tourist and recreation destination," said National Park officials Bantimurung, Abidin in Maros, Sunday (29/11). He said the National Park Bantimurung a natural park the proudest people of South Sulawesi. Because of its location in the valley there is a steep limestone hill with tropical vegetation. 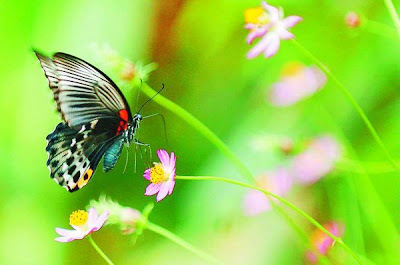 "Bantimurung is known as a butterfly paradise because of all the species here. At least 20 species of butterflies are protected by the government and established through Government Regulation No. 7 / 1999," he said. He said that in 1856-1857 Alfred Russel Wallace spent most of his life here to examine different types of butterflies. "Wallace said Bantimurung is 'The Kingdom of Butterfly' he said. "Therefore, based on studies of English people there are 150 species of butterflies here and this is the main attraction for tourists," he said.